It’s ironic how much damage can happen to your guitar when you’re not even playing it. 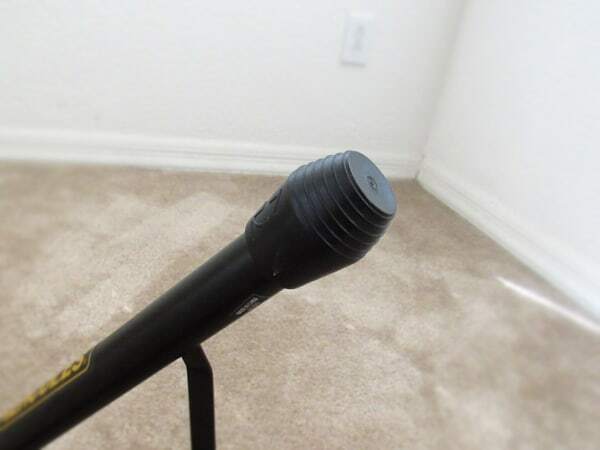 One of the most common scenarios is your guitar getting knocked off the stand, or the guitar stand itself getting knocked over (with your guitar in it). 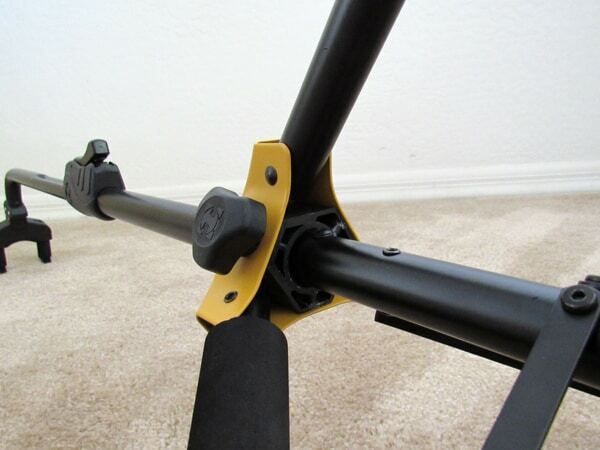 While you can get traditional tripod or A-frame style guitar stands for under $10, you compromise a bit of security for the savings. Those stands are cheap for a reason: they’re usually made of thinner, lightweight materials, and are balanced in a way that makes them easy to tip forward. Imagine, if you will, the guitar gods taking a standard floor guitar stand and smashing it together with a wallmount guitar hanger. From an explosion of lightning and thunder emerges the Hercules AGS Guitar Stand, a hybrid floor stand where the guitar actually hangs from the headstock. 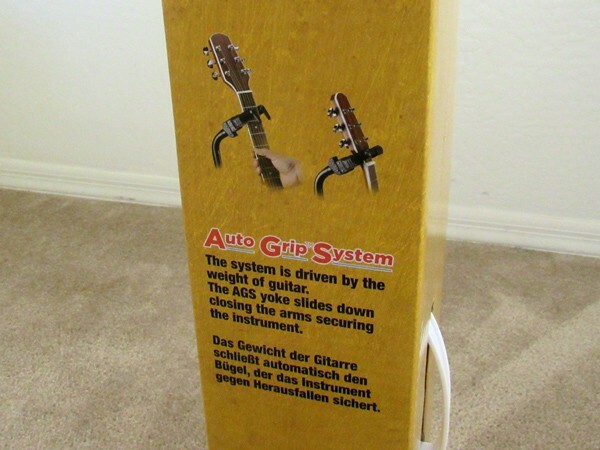 “AGS” stands for Auto Grab System, which refers to the “auto grab” mechanism built into the yoke (the part that the guitar hangs from). When you place your guitar into the yoke and let go, the weight causes two little arms to automatically close–preventing the guitar from coming out. Lift the guitar and the little arms open back up, and your guitar pulls away freely. This model’s official name is the Hercules GS414B. Hercules GSB001 carrying bag – a basic zip-up bag specifically for Hercules stands. Hercules HA101S AGS lock system – prevents the guitar from being (easily) removed from the stand. Some guitar stores use this to deter customer from trying guitars without permission. The first thing I noticed was how sturdy and beefy the Hercules was. 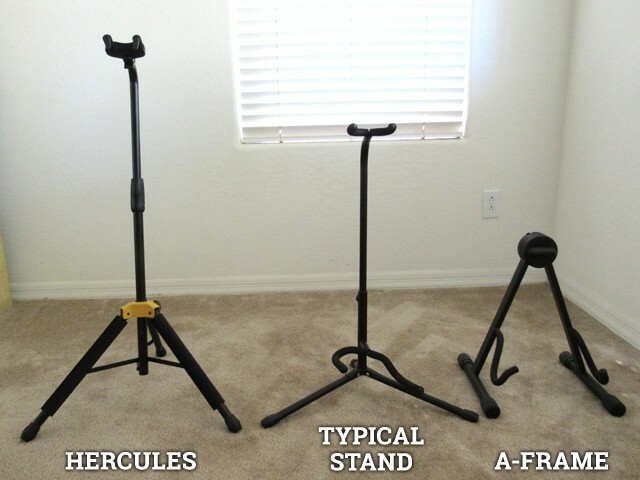 Unlike cheaper floor stands, the Hercules uses fatter tubing than usual, which improves the stand’s strength. Insert the neck/yoke portion into the base and you’re ready to go. The Hercules guitar stand, ready for just about any size/shape guitar (or bass) you can throw at it. 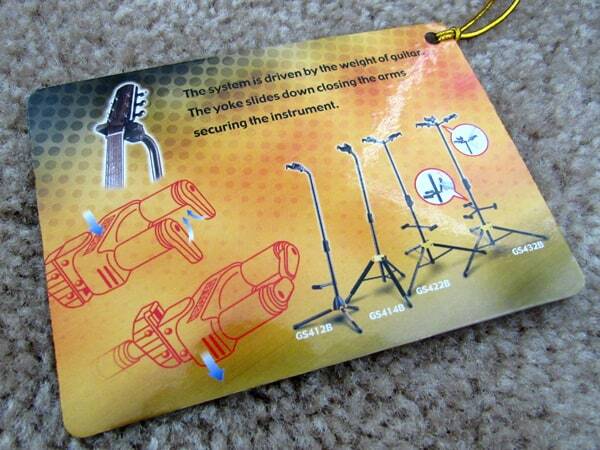 Putting a guitar on the Hercules guitar stand is just as easy as any other guitar stand. The little arms on the yoke swing up when you let go. This stand does the job quite well. 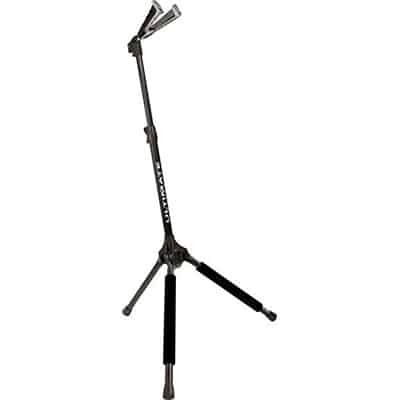 I couldn’t find much that I didn’t like about the Hercules AGS Single Guitar Stand. 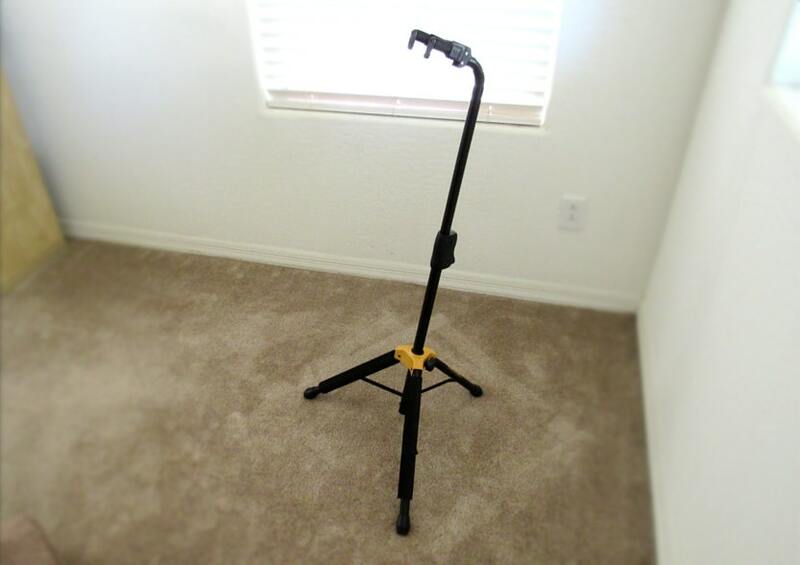 It combines the best aspects of a floor guitar stand with those of a guitar wall-hanger. The fact that the guitar hangs from the headstock means this stand will accommodate just about any size and shape of acoustic or electric guitar–including oddly shaped guitars. It’s worth pointing out that this stand works perfectly for bass guitars too, because the height can be easily adjusted. 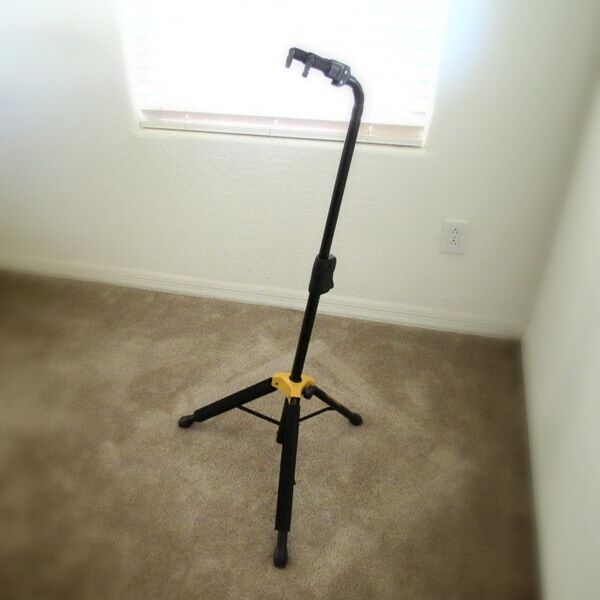 Setup was quick and easy–comparable to that of other tripod-style guitar stands. Not quite as quick as some cheaper A-frame guitar stands, but the Hercules only takes a few seconds to extend and secure the legs, then stick the neck holder in and set it to the correct height. 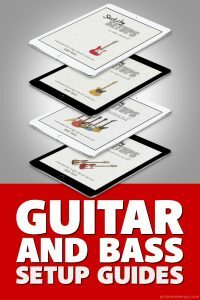 I deducted 1 star here because there may be a little trial-and-error your first time around as you experiment to find the right height for your guitar. Also, the yoke was just barely wide enough for my 7-string electrics. They did fit, but I had to be more careful putting them in and taking them out of the yoke. My Classical acoustic guitar would not fit–the neck was simply too wide for the Hercules. Let’s be honest, this isn’t a bargain-basement guitar stand. 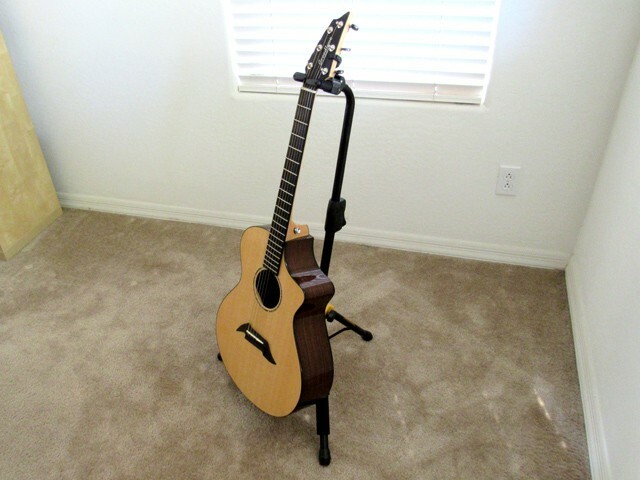 It’s a rugged, quality guitar stand that dips its toe into the “premium” category. 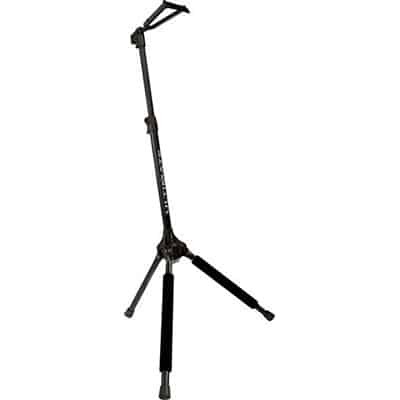 That said, it’s a bit more expensive than lesser guitar stands, but you get great value for the slightly higher price. In other words, you definitely get what you pay for. Though it’s not mentioned anywhere, this stand does carry a lifetime warranty. After I initially published this review, a representative from the company wrote to inform me of this. This is a huge benefit–something Hercules definitely needs to feature in its marketing. Setup was fast and simple–just as fast as putting together any other standard floor guitar stand. With regards to putting your guitar in and taking it out of the stand, well, that was fast too. The auto grip system in the yoke seamlessly and quickly deploys when you put your guitar into the yoke, and it quickly opens as soon as you lift your guitar to take it out. You’ll barely even notice it’s there. When set up properly the Hercules stand isn’t going to damage your guitar–not in any way that I can discern. There’s rubber padding everywhere your guitar touches the stand, and it’s specially formulated rubber that will not interact with nitrocellulose finishes. 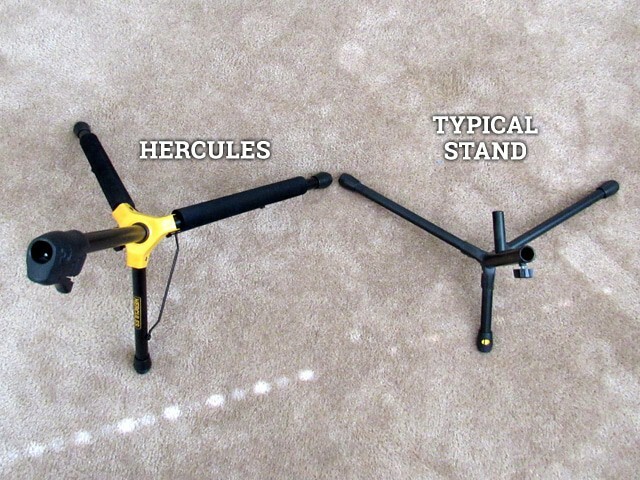 Further, I found that the Hercules is much more stable than other guitar stands. 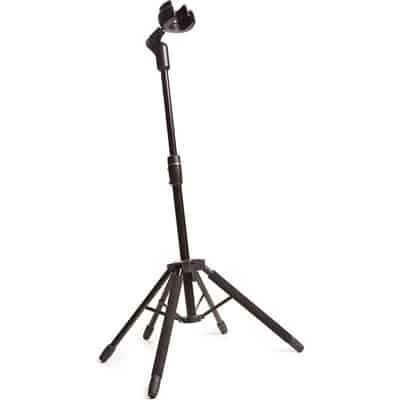 The combination of its wide tripod legs, slightly heavier weight, and backward tilt all help the stand stay firmly upright when bumped. In fact, it’s kinda difficult to tip the stand over–with or without a guitar in it. Here’s why I deducted 1 star: Be careful when first setting the height of the stand. 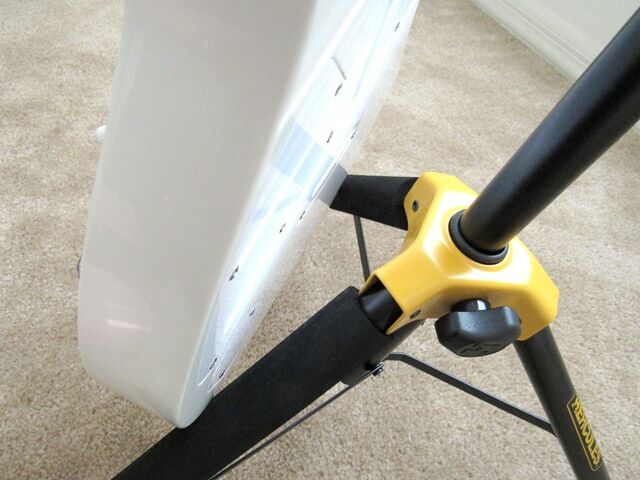 Set it too high and your guitar’s body can hit the yellow metal junction at the base of the stand. Set it too low, and your guitar’s body can hit the ground. Both situations are easy to avoid if you simply pay attention to what you’re doing. 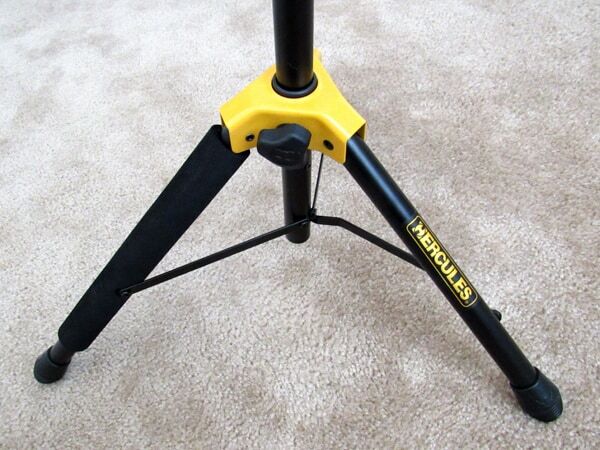 The Hercules AGS single guitar stand is definitely more secure and stable than standard tripod-style guitar stands. It’s downright difficult to knock over and holds onto your guitar securely when bumped. Accommodates just about any 6-7 string guitar. 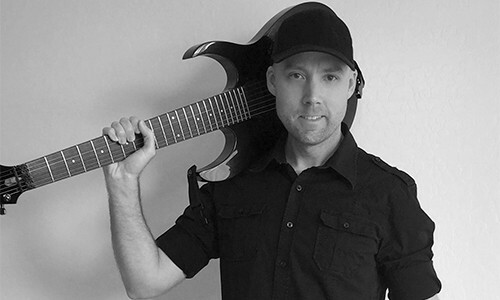 It had no problem with my 7-string Ibanez electrics. Doesn’t accommodate some wider guitar necks. My Alvarez Classical guitar’s neck was too wide and would not fit into the yoke. The Hercules AGS single guitar stand is a substantial upgrade from cheaper, standard yoke-style and A-frame style guitar stands. It’s beefy and much more stable than cheaper stands, so your guitar is actually safer when stored in the Hercules. If you have an oddly-shaped guitar and have struggled to find a stand that’ll work, the Hercules just may be your answer. 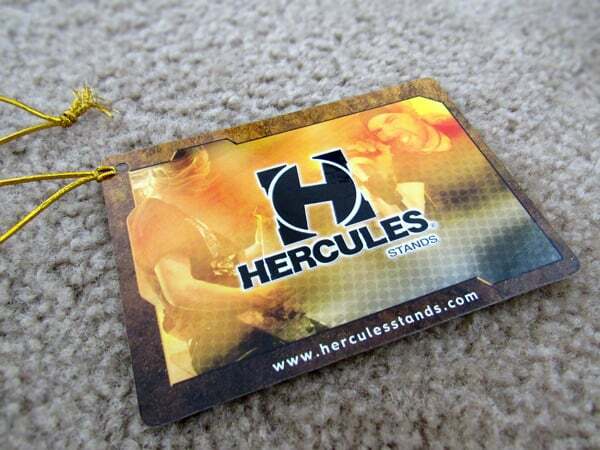 The manufacturer advertises the Hercules as using “specially formulated rubber” for all the padded bits, which implies that it won’t interact with your guitar’s finish. After I initially published this review, a company representative wrote to assure me that the stands have been tested extensively and proven safe on nitrocellulose finishes. However, no mention was made regarding polyurethane finishes. Overall, a very nice guitar stand. The Hercules is now in service full-time in my studio, which means if anything changes I’ll come back and update this review (including changing ratings) as necessary. Can’t be that premium if the plastic grip becomes a sticky mess and disintegrates within months, causing the whole thing to fall apart and consequently drop my guitar onto the floor in the process. Apparently these stands are notorious for falling apart over time. Hi Guthrie. I can’t write a review based on experiences that are not my own. That goes against my principles. 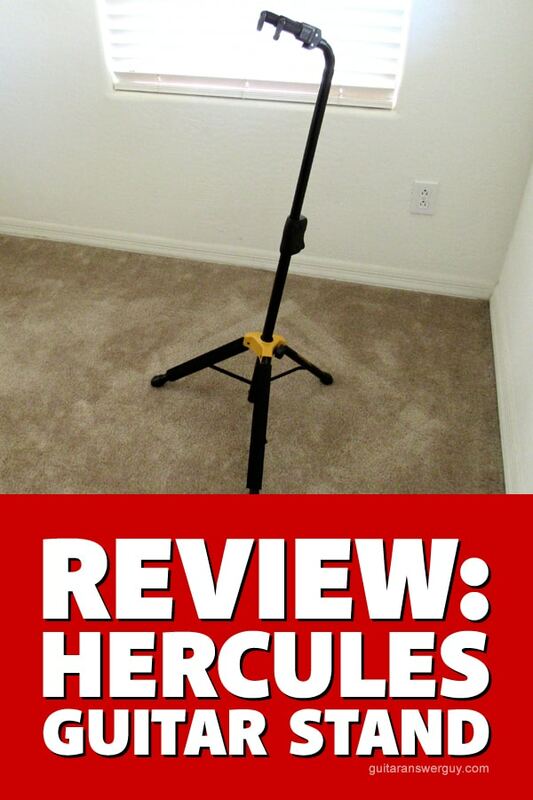 However, if anything ever changes with my Hercules stand, for any reason, you can rest assured that this review will be updated accordingly. I’m not compensated or sponsored by the Hercules company in any way, so there’s no incentive for me to withhold information. The long term viability of any product I review is part of the equation, so if something goes haywire later down the road, that’ll be included as an “update” to the review. That said, only time will tell. Since publishing my review in April 2017, my stand is still going strong and I haven’t had any issues yet. Hercules had a period where they used a certain plastic for a soft grip. It eventually deteriorates. Just contact them and they’ll make it good. They replaced three old ones if mine. I’m pretty sure you’re correct about this. Many of the complaints that I see are from people with stands that are 3+ years old, and Hercules has remedied this plastic issue since then. Further, if you email and tell them about any issues you’re having with your older stand, they’ll send you a new one. 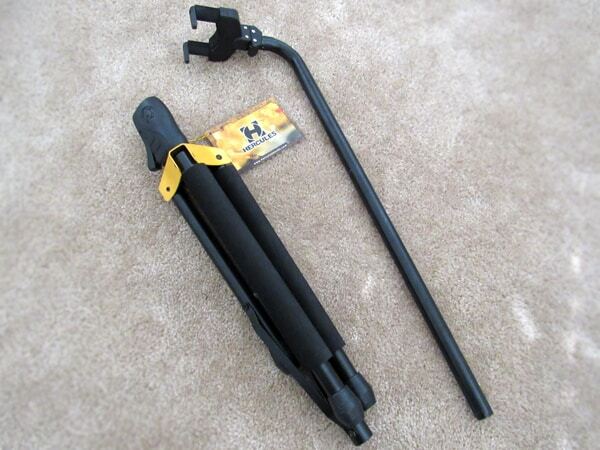 The Hercules stand featured in this review has been in constant use since I published this post in April 2017 and I’ve had no such issues with my handle deteriorating. I’ll keep an eye on it though, and if I begin to see any kind of deterioration I’ll update this review accordingly. However, so far… so good. Wow! I have three of these, and the oldest of them (about 8 years) just fell apart dropping my CS Tele to the floor. What a sticky, gooey mess! My two other stands (roughly 6 years each) are also in a state of deterioration! I’ll try contacting Hercules in hopes they’ll make good on their warranty. Hercules are without doubt among the best guitar stands on the market, I own five of these GS414B myself. I bought them around four years ago and wouldn’t fault them–until a few weeks ago when I noticed that the trigger release assembly, which facilitates lowering and raising of the upper part of the stand, was disintegrating around the pivot pin on three of the stands. As these pins are located very close to the edge of the assembly, I can only assume that over a short period of time the plastic has degraded enough to become weakened by the constant pressure of the spring in the actual assembly. I have since been in touch with the Hercules Company, who passed me on to their UK supplier. The representative is, however, on vacation at the moment, but on his return I will be wanting to know what they can do about this problem. Hi Iain, keep me posted on how it goes. As you can see from Rob’s comment below (Rob is actually at Hercules), they offer a lifetime warranty on their products and are willing to send you replacements. I’ve had my Hercules for a few months now and it’s still going strong. I had three Hercules stands — 2 of the GS432B, and 1 GS422B (holds 3 and 2 guitars respectively). They both have the same mechanism, and over time I found that one or more of the holders on all three stands ended up ‘broken’ whereby they wouldn’t open fully. 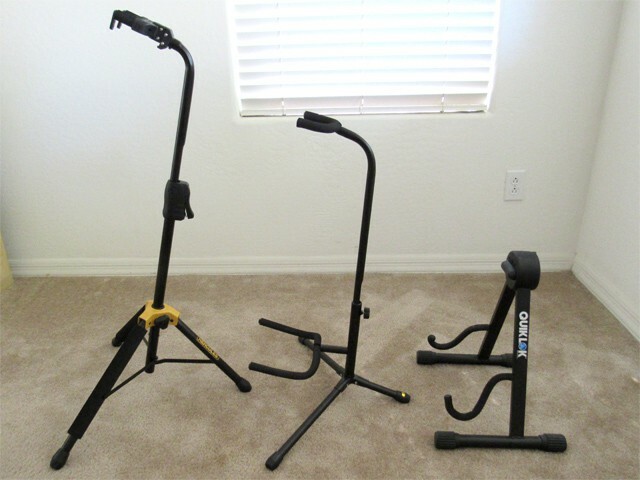 I contacted Hercules, and although they couldn’t figure out how to “fix” it, (and in fact their instructions further broke one), they were generous enough to send me THREE new stands to replace them. Hey Murray, thanks for the comments. I had read some reviews to this effect on Amazon, but they were all older reviews from a few years ago. I was wondering whether this was still an issue or not. My stand is brand new, so it’ll be a few years before I know for sure. 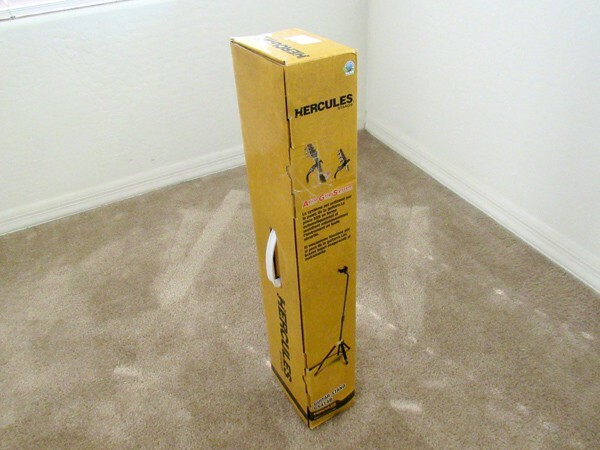 However, we can have the peace-of-mind of knowing Hercules backs their stands with a lifetime warranty (they just don’t advertise that fact very well) and will happily replace any that prove defective for any reason. Great review. Thanks for sharing your opinion on the stands. In response to Murray’s comment, Hercules Stands offer a lifetime warranty against manufacturer defect, so when we uncover problems like what Murray experienced, we’re happy to help out and “stand” behind our products (sorry for the bad pun). The mechanism he’s describing did have a defect in the compound that the plastic was made from. We’ve since been able to isolate and solve that problem in the manufacturing process, so current models of our stands should not experience this. Of course, if any defect does arise, just let us know! More information can be found at our website, http://www.herculesstands.com. 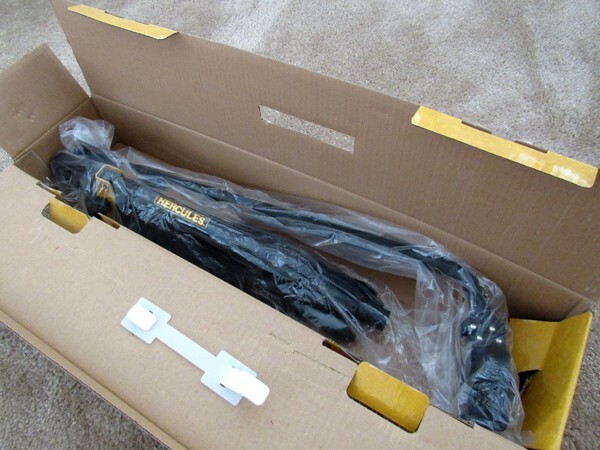 Hi Bobby..thanks for the detailed review..I quite like the Hercules stand but there’s a problem gone unnoticed..can it accommodate the guitar while still in its gigbag..which is mostly the case in India..At home there is lot of dust so I usually keep it in the bag when I m done practicing.. If you have a serious dust problem, another option is to put a large plastic bag–like a trash bag–over your guitar when you’re not playing it. I live in Arizona, where dust can also be a problem (though not as bad as India), and this is exactly what I did for awhile: I’d put the guitar on the stand, then just slip a trash bag over the top. The trash bag is big enough to cover the guitar AND the guitar stand.